Lester Breuer is back with another completed freight car model. Here’s his latest. After sharing my Sunshine Models CB&Q box car build on this blog (for which Frank Hodina did the masters), I thought I would build a refrigerator car. From my inventory of kits, I chose this Sunshine Models Pacific Fruit Express R-40-18 refrigerator. Frank also created the masters for this kit. Once the car body castings were assembled and the roof was added, interior corner bracing was installed using scrap kit sprues in the corners for strength. After the underframe is fit into place, I added the kit center sill, needle beams and bolsters. 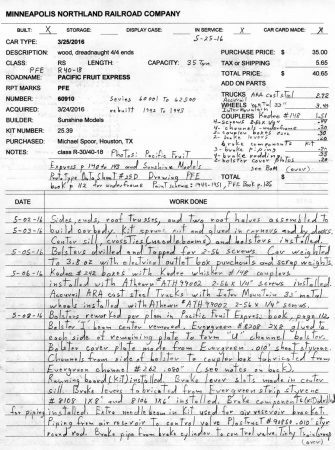 The bolsters were reworked per the plan on page 112 of Pacific Fruit Express, by Thompson, Church, and Jones. Electrical outlet box punch outs were glued to bring the car weight 3.8 ounces. Kadee # 242 coupler boxes with #148 “whisker” couplers were installed. Accurail ARA cast steel trucks were used with InterMountain 33” metal wheels. 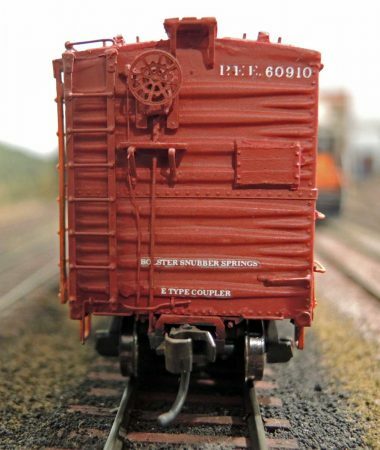 At this point the model for me becomes three projects: the car body visible detail, the underframe detail normally never seen on a car in service on my Minneapolis & Northland Railroad, and the paint and lettering. I usually work on the underframe details first. Sometimes I cheat and leave out some of the detail. A train line was installed using Evergreen 0.020-inch styrene round rod. A dirt collector from Tichy brake set #3013 was also used. The kit brake components were drilled for piping and brake levers were fabricated from Evergreen 1×8 and 1×6 styrene. Plastruct 0.010-inch styrene round rod was used to connect the air reservoir to the control valve. Tichy Train Group 0.0125-inch” phosphor bronze wire was installed for the brake pipe from the brake cylinder to the control valve, as well as the brake rod components. The brake chain is a short length of Campbell 40 links per inch. I keep a running list of processes and parts for each model. Next up, I added the more exciting visible car body detail using the kit instructions and PFE book photos on pages 140 to 143 as reference. I left the bolster caps off, based on photos of the R-18, R-19s, classes on those reference pages, and in the R-40-2 drawing on page 112. Many kit parts were installed, including the running board, ladders, stirrup steps, side 23-inch grab irons, ice bunker hatches, placard boards, brake platform, brake wheel housing, retainer valve, bell crank, and eyebolts. I substituted Tichy 18-inch straight grab irons on the ends and a Kadee Ajax brake wheel. Some small parts were fabricated. Running board extension brackets were made from Evergreen 1×2” strip styrene. The roof grab irons and uncoupling levers were bent from Tichy 0.0125-inch phosphor bronze wire, while the retainer line is Tichy 0.008-inch phosphor bronze wire. The car body is now ready for paint. The car body sides were sprayed Vallejo Bright Orange, Model Color 70.851. The roof and car ends were sprayed Vallejo Model Color Calvary Brown 70.982. The underframe and trucks were sprayed Vallejo Model Air #29022 Tarnished Black. PollyScale Clear Gloss was sprayed onto the car body to prepare for decals. The kit supplied decals were applied. After the decals were set and dry, the car body was sprayed with Model Master Flat Clear Acryl # 4636. The model was weathered with Pan Pastels and eye shadow makeup. After this satisfying and enjoyable build, the PFE refrigerator car is put into service on the Minneapolis & Northland Railroad. 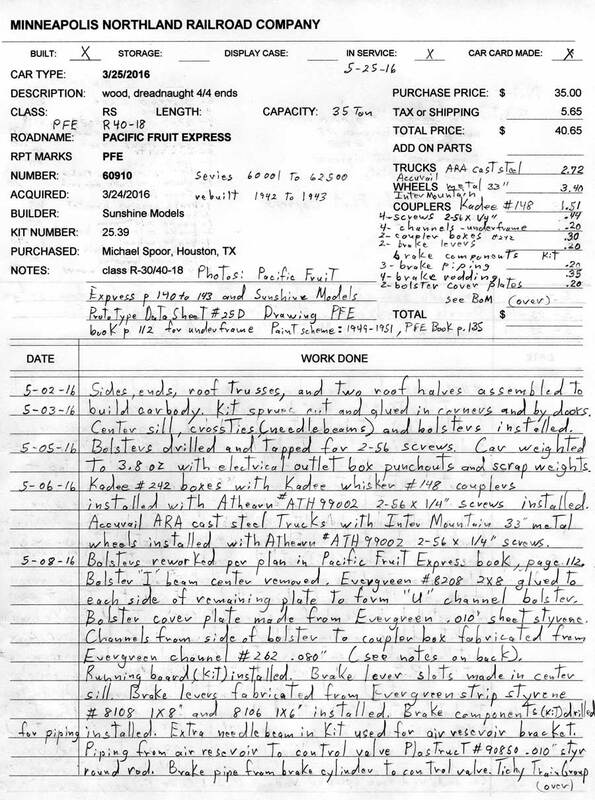 Thank you, Lester, for sharing your techniques to build a fine PFE reefer. Questions and comments can be posted below. Please follow the instructions so your comment can be posted. All comments are reviewed and approved before they appear. To subscribe to this blog, enter your info for a comment and check the last box to notify of new posts by email. Share the blog link with other model railroaders. Is this available in North scale??? That’s very useful as I have one of these to build thank you for posting. Paul Thank You. If during your build you have problems, you can send me an email to me direct and I would be glad to help if I can. Thank Lester Breuer for including the Vallejo Color names and Stock Numbers. Do you like the Vallejo paints better than other brands such as Testors Acrylic, and Accuflex? Ray Thank you. I do like the Vallejo paints which I began using after PollyScale was no longer available. I like that Vallejo come in Model Color ( paint brush ready )mane Model Air ( air brush ready ). Yet Model Color can be thinned for airbrush use. Great paint color charts for both lines available via download on Vallejo website. I use Model Master paints too so I am using Testors whih owns them. Ray I apologize for the typos in my response. I am having internet problems and attempting to type at a very rapid pace to overcome line drop problems.